The Otago Peninsula (19000ha), stretching along the southern edge of the Otago harbour is an easy drive from central Dunedin. A wonderfully scenic trip will see you passing lush green pastures, small bays and inlets, sandy beaches, rugged hills and volcanic landforms. So near to a major city centre, yet so far removed from the hectic pace of city living. The Otago Peninsula is a frequently visited eco-tourism area in Dunedin. Its unique and fragile ecosystem is home to rare wildlife. Please ensure that you camp only in permitted areas. • Seals: Don’t come between seals and the water, for your safety remain at least 10 metres away from seals. • Sea Lions: Do keep well back. Sea lions are not afraid of you and can move quickly over short distances. • Penguins: Avoid letting penguins see you. Talk quietly and move away slowly. Keep to the tracks and away from nest sites. Use viewing hides where available. • At all times follow guides' instructions, this will not only protect the wildlife but is also for your own safety. • Respect our cultural heritage. Dunedin and the Otago Peninsula have a spiritual and historical significance to tangata whenua, the local Maori people. • Protect and respect our plants and animals. Penguins, seals, sea lions and albatross are sensitive to people. • Leave no trace of your visit. 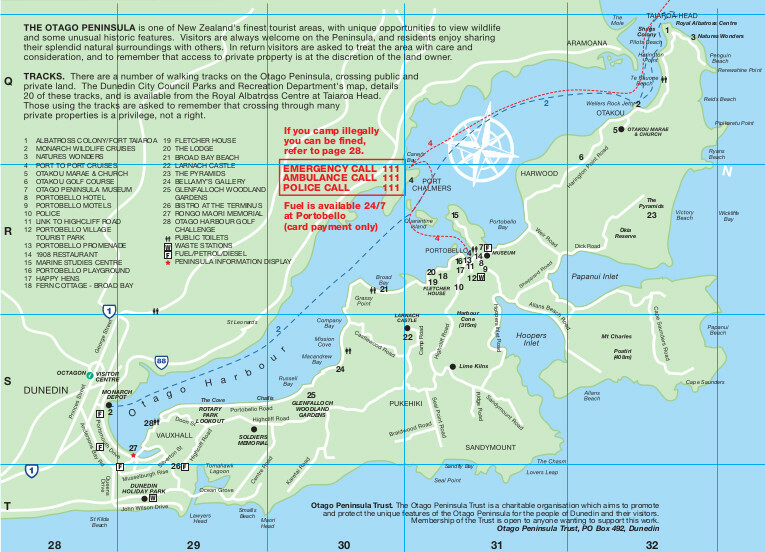 • Use the public toilets provided - refer to map page 28 for Peninsula locations (2010 Dunedin A to Z Visitor Guide). • Many walking tracks on the Otago Peninsula cross private property. Accordingly please remember to treat access in a responsible and respectful manner, as it is a privilege not a right. Please be aware that there are no petrol stations on the Otago Peninsula.